Gardengreens is based in Forest Hill and offers a professional and reliable gardening service that includes garden design, planting, turfing and general maintenance. In addition to general gardening services, we specialise in helping you to grow fruit & veg in your own backyard all year round - whether you have a garden, a courtyard or simply a balcony. It's the perfect time of year to start thinking about growing your own produce and with our help you'll soon be able to eat seasonally and avoid packaging, food miles and over-priced supermarkets. We would like to take this opportunity to thank all our SE23.com customers for their support over the past year and wish everyone a Happy New Year! Happy New Year to you too Simon. I recommend Simon to any SE23 resident needing a gardener. Our experience with him was that he was prompt, courteous, efficient and good value - pretty much all we look for in a business partner. We will certainly use Simon again for any of our clients gardening needs. I have used Simon for the last year, and as well as being efficient and hard working, he also gives great advice on how to get the most from plants and vegetables! I used Simon last year to clear our very overgrown garden. He was pleasant, efficient & tidy & did a really good job. I would recommend him & will certainly use him again. Another recommendation for Simon! He has recently completed an excellent job on overhauling my front garden. He is reliable, professional, friendly, very reasonably priced and most importantly and excellent Gardener. We will be using him for all our garden needs in the future. Simon has been over to help us with our Garden a couple of times already, he is knowledgeable, friendly and a true green finger! He comes highly recommended from us novices in SE23! If you care about your garden, but have little time to do the work then Simon is your man. As a keen gardener who has completed the RHS Level 2 course I was reluctant to let anyone into my garden. However, after meeting Simon it was clear he had an excellent knowledge on all aspects of gardening and more importantly was someone I could trust to do things properly. Despite the weather going against him he worked tirelessly to build 3 raised beds, lay turf, transplant shrubs and a whole lot more. I will definitely be using him again and would recommend him without hesitation. I would have liked to use Simon but I am worried about his charges. They seem to be a bit high for the area. We used Simon a couple of months ago and were very impressed. In my opinion his charges were completely reasonable - i certainly didn't feel that I paid over the odds considering the great job he did. Simon came to help with my neglected garden, which needed some TLC from someone who knew what they were doing, and he certainly did. The work they achieved in one day in the recent hideous weather was remarkable and we can now see the whole of the garden. He offered some great advice in terms of next steps and at a reasonable price, which we are certainly considering. I would definitely recommend Simon & Garden Greens to anyone in the area looking for help with their garden. Simon came to clear our massively overgrown garden and did a cracking job. He even uncovered a path we didn't know existed! I would recommend Simon to anyone looking for advice and help in relation to their garden. Thanks very much Simon! 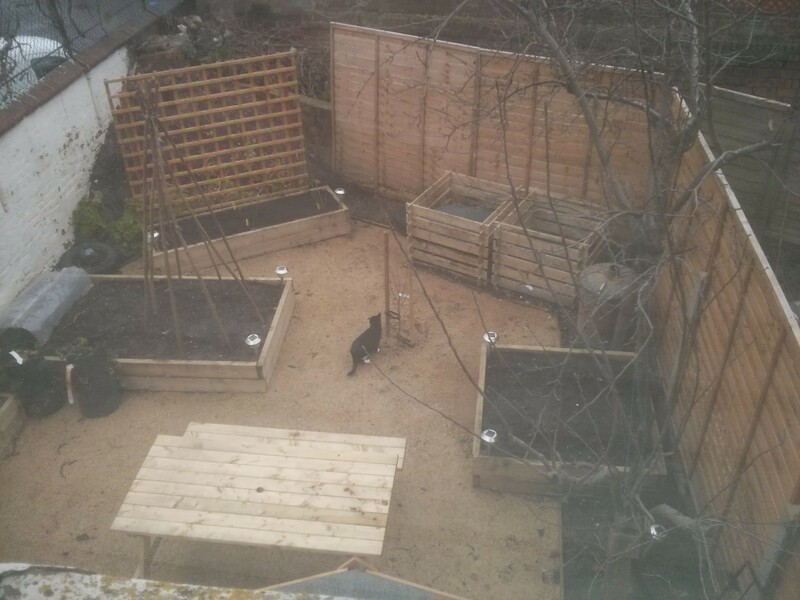 Simon has done a complete redesign of my run-down 35ft or so rear garden in Honor Oak and I'm pleased. Despite my inexperience in gardening, I was fully involved. And I learnt a great deal as well. Pleased especially with use of horizontal and vertical trellis to give greater privacy in (without being walled in), and the overall design/planting. We would thoroughly recommend and will very likely use Simon and his team again. Very consultative, knowledgeable, patient, friendly and most importantly extremely good! Our garden had got out of control and after a friendly and comfortable visit to quote and advise; they methodically, professionally and effectively got everything back in order. Everything done to agreed time parameters and afterwards we were given sound advice in a trustworthy and supportive manner. 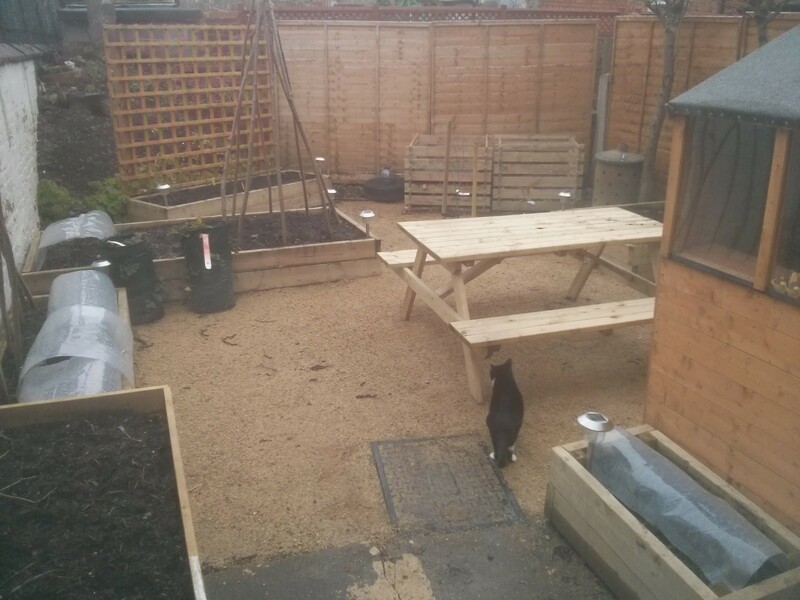 We've just had some work done by Simon from Garden Greens and it's completely transformed our garden. To start with we had an overgrown mess as you can see at the top of this pic. 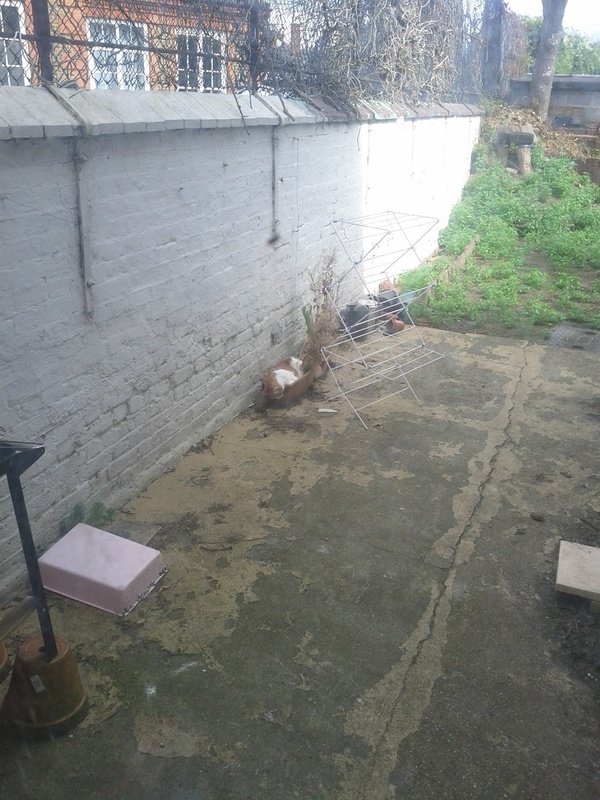 After clearing out the weeds we basically had a barren wasteland with a couple of pots and a grow bag on it. 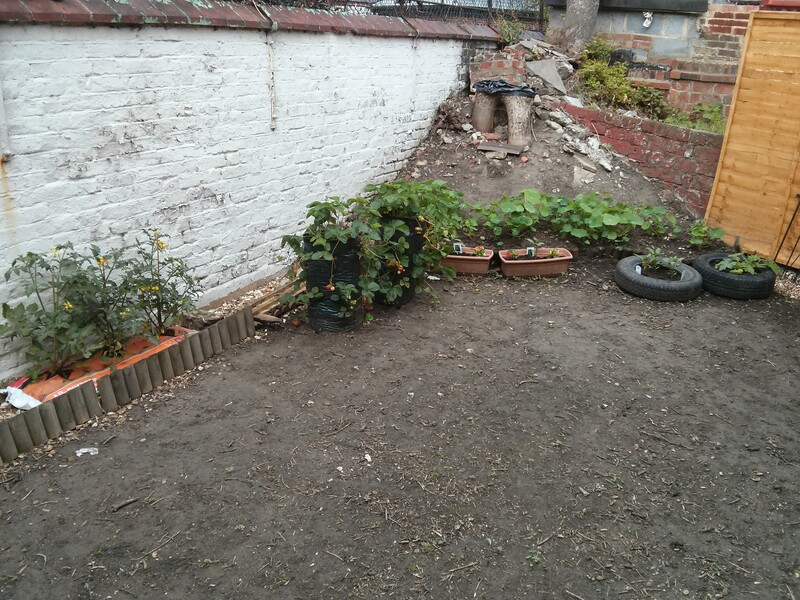 Now we've got raised beds, a shed, growing canes, compost bins, a picnic bench, and various fruit trees ready to fruit in the summer -- all designed and installed by Simon, along with lots of helpful tips about what else to grow, and how to grow it. We're now looking forward to a summer of fresh fruit and veg from the garden! This post was last modified: 12-02-2014 04:50 PM by RussB.